12 Volume XII pages 3195 to 3206. 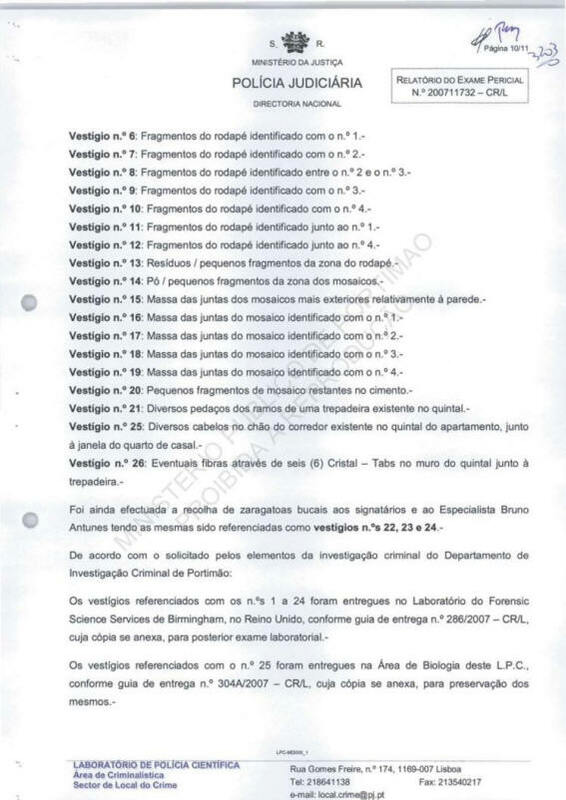 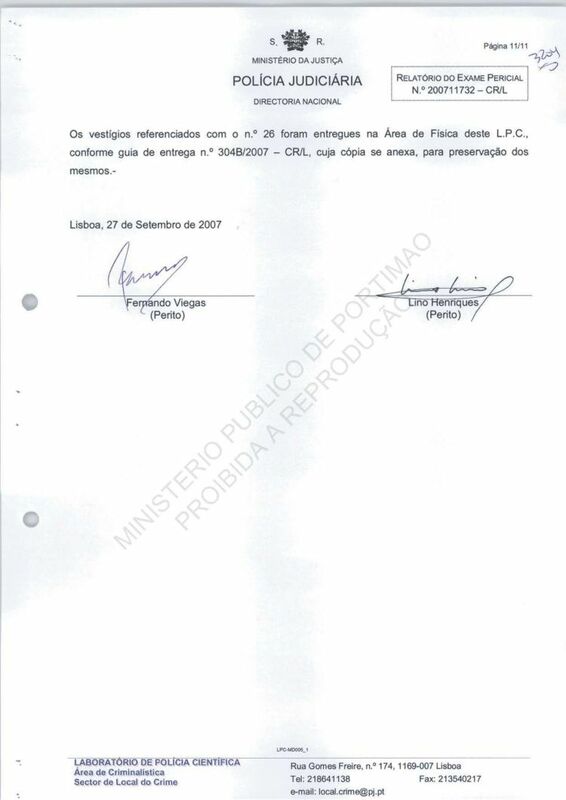 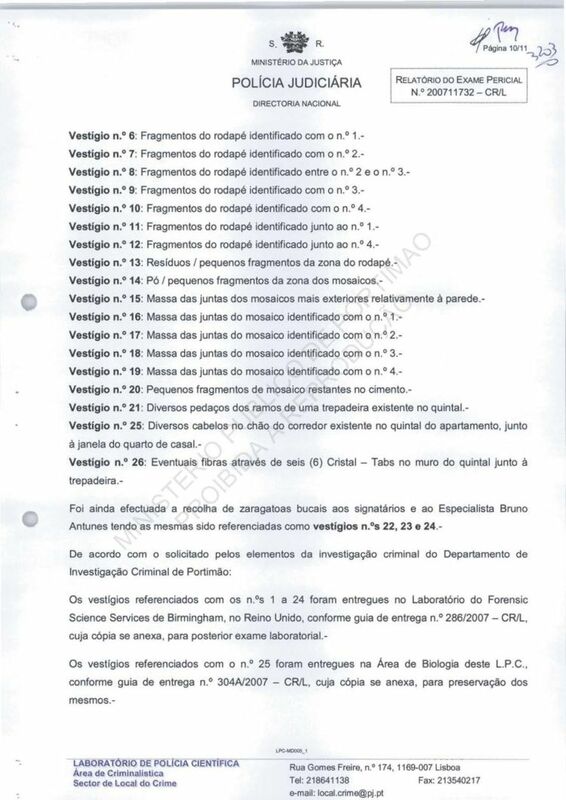 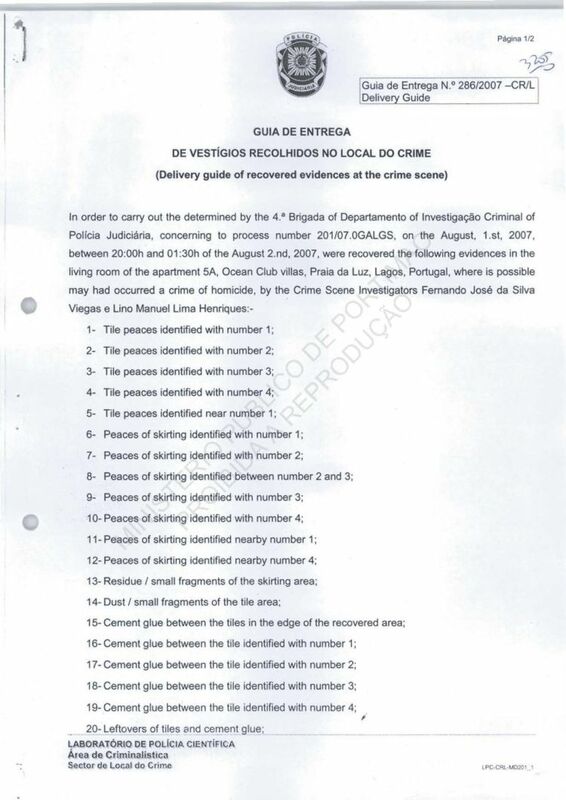 On 1 August 2007, at 20h00, a crime laboratory team comprising the signatories went, at the request of DIC Portimao PJ, to a residence at [the above address] in order to collect trace evidence from the place. There follow photographs of the outside of the apartment from where trace evidence was recovered as well as the detail thereof. 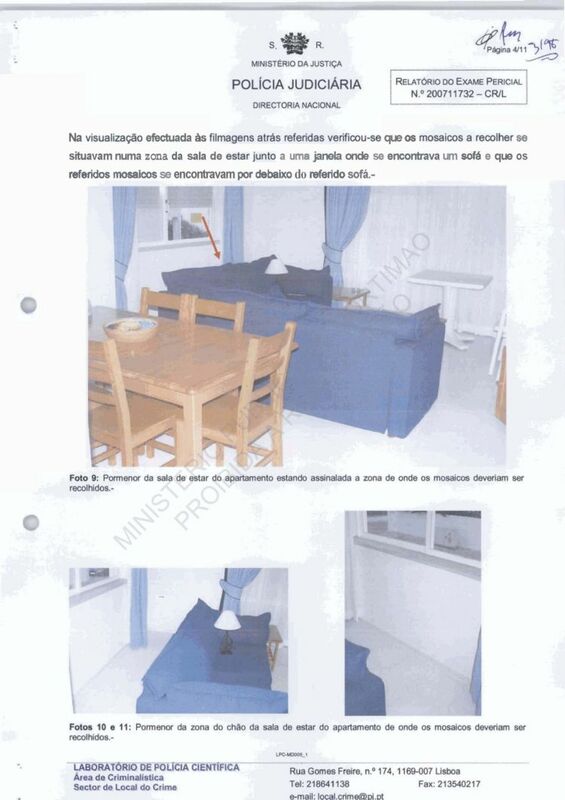 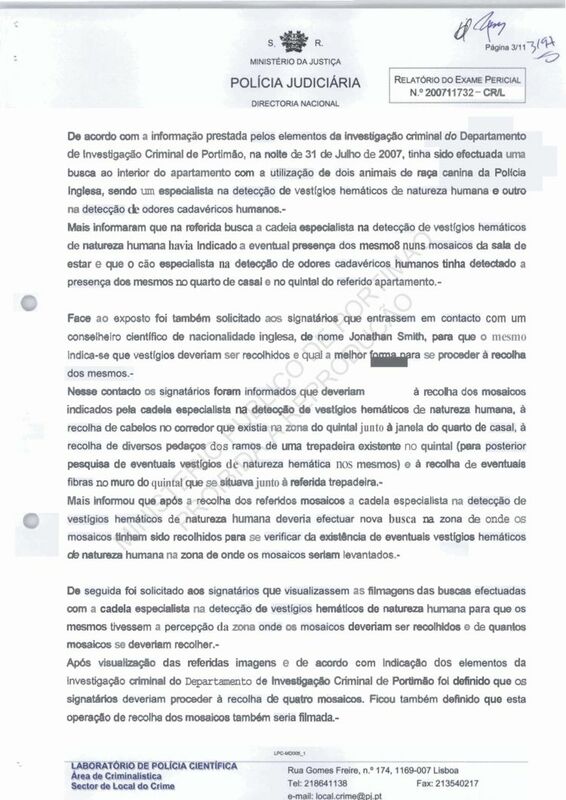 According to information provided by the DIC of Portimao, on 31 July 2007 a search had been performed inside the apartment using English police dogs one specialised in the detection of traces of human blood and the other in the detection of human cadaver scent. Because of this it was also asked of the undersigned that they entered into contact with an English scientific advisor, named Jonathan Smith, who indicated which traces should be collected and the best way to proceed with their collection. In that contact the undersigned were told that they should [OCR error: missing word taken to be "proceder": to proceed] proceed with the recovery of the floor tiles indicated by the dog specialised in the detection of human blood, with the recovery of hair in the corridor [pathway] that exists in the area of the back garden next to the window of the couple's bedroom, with the recovery of several pieces of the branches of the climbing plant in the garden (for later check of possible blood traces on them) and with the recovery of possible fibres on the garden wall next to the climbing plant. 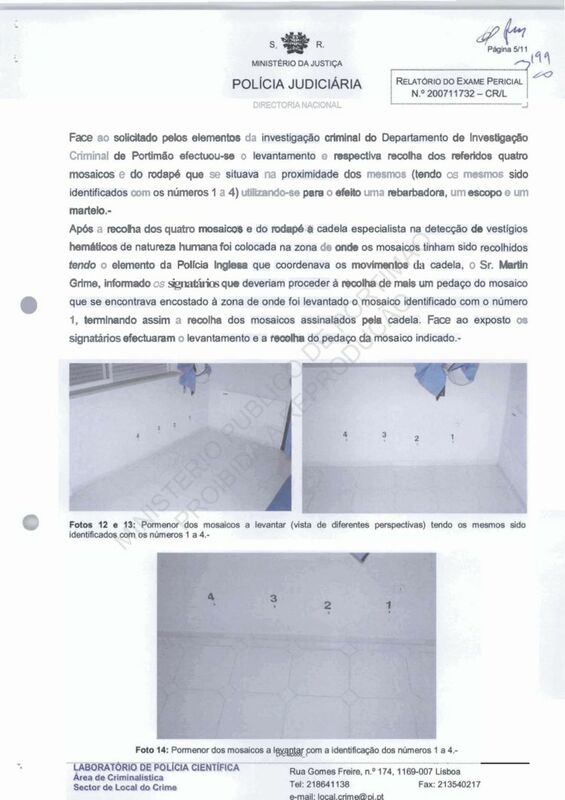 He advised further that after the recovery of the tiles the animal specialised in detection of human blood should perform another search of the area from where the tiles had been recovered to verify [check for] the existence of possible human blood in the area from where the tiles had been lifted. 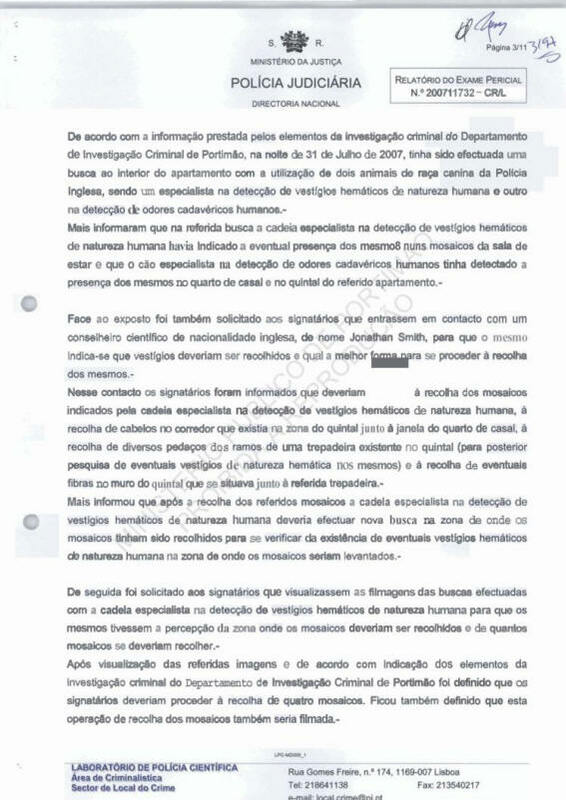 Subsequently it was asked of the undersigned that they watched the films of the searches performed by the dog specialised in detection of human blood so that they obtained an understanding of the area from where the tiles should be collected and how many tiles they should collect. 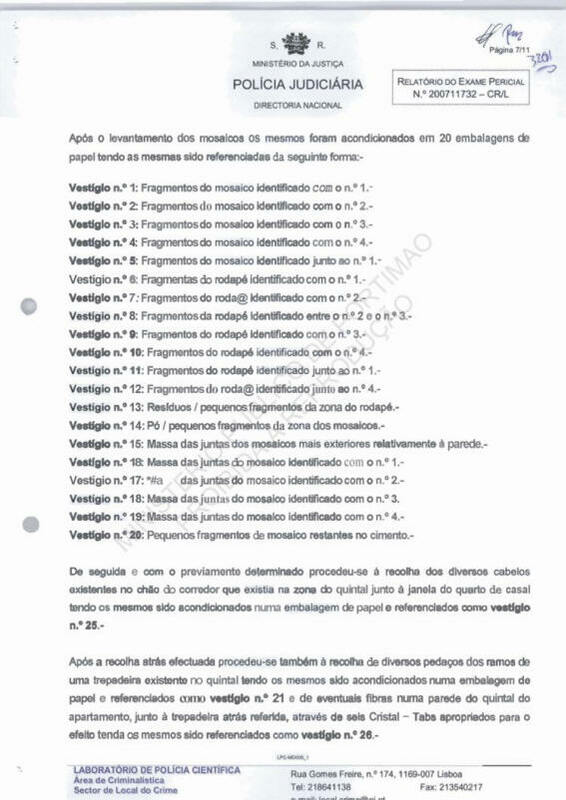 After seeing the images and in agreement with the officers of DIC of Portimao it was defined that the undersigned should proceed with the recovery of four tiles. It was also defined that this operation of recovery of the tiles would also be filmed. 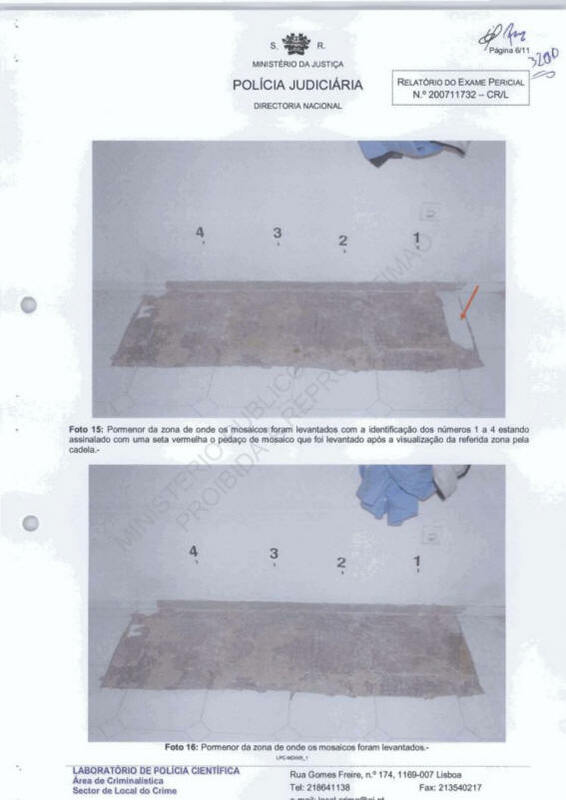 As requested by investigating officers of the DIC of Portimao it was performed the lifting and respective recovery of the four tiles and of the skirting board next to them (they being identified with numbers 1 to 4) using a tile trimmer, a flat chisel [spelling mistake in report: "escopo" should be "escopro"] and a hammer. 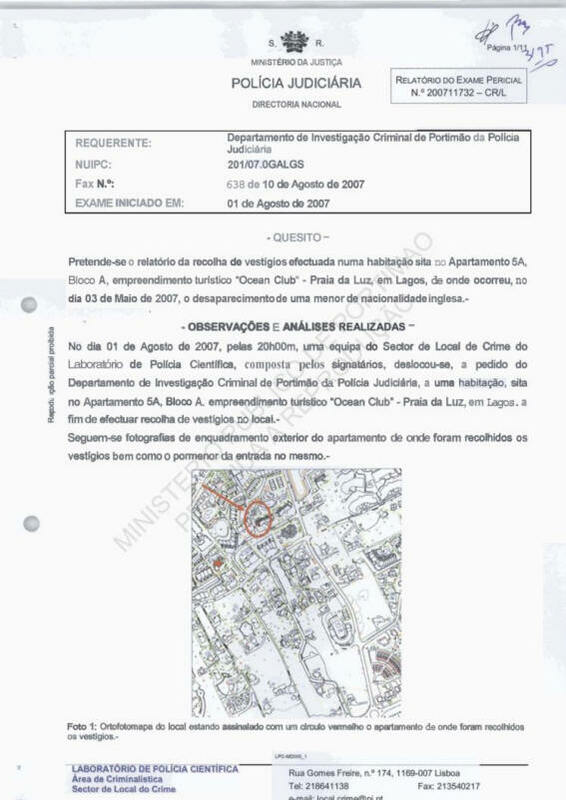 After the recovery of the four tiles and the skirting board the dog specialised in the detection of traces of human blood was put into the area from where the tiles had been recovered, the English police officer who coordinated the movement of the dog, Martin Grime, having informed the undersigned that they should proceed with the recovery of another piece of tile that was close to the area from where the tile identified as number 1 had been lifted, that terminating the recovery of the tiles signalled by the dog. 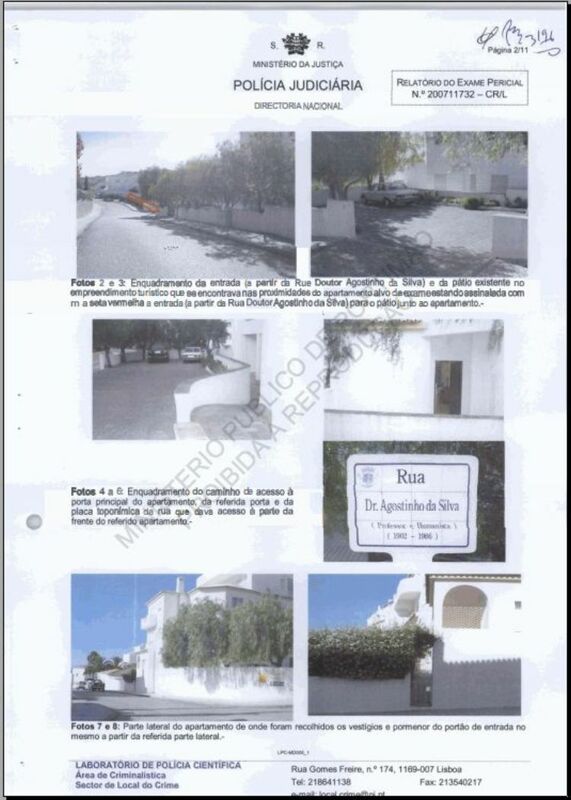 As requested the undersigned performed the lifting of and the recovery of the piece of tile indicated. 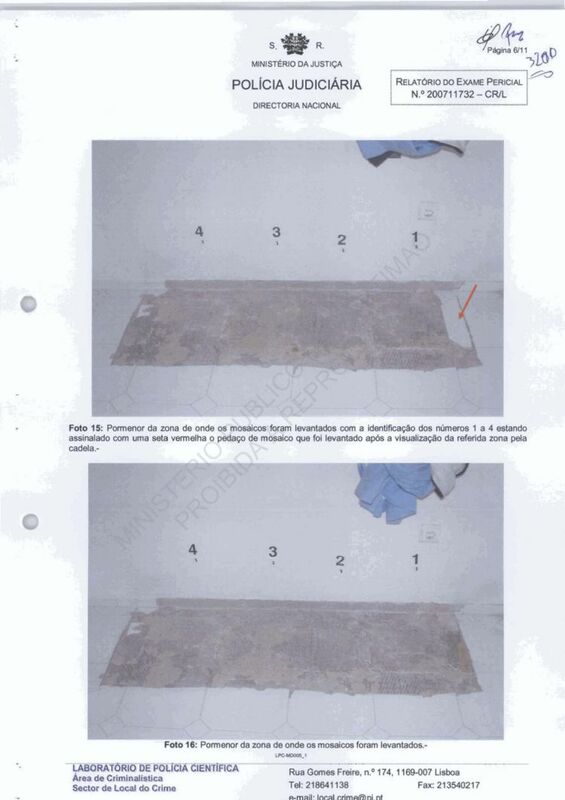 Photos 12 through 14: Detail of the floor tiles numbered 1 to 4 (from different perspectives) [before lifting]. 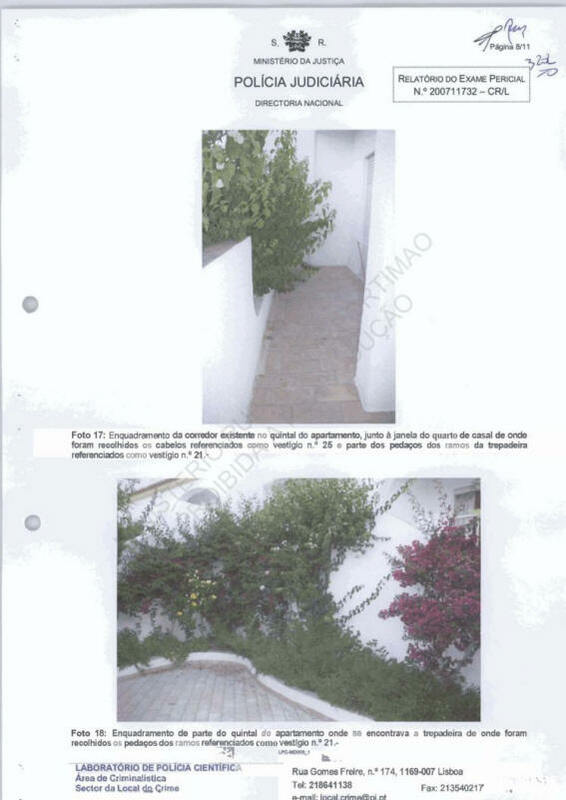 Subsequently, as previously determined, there proceeded the collection of various hairs from the ground of the pathway in the garden area next to the window of the couple's bedroom, they having been encased in a paper package referenced as trace evidence number 25. 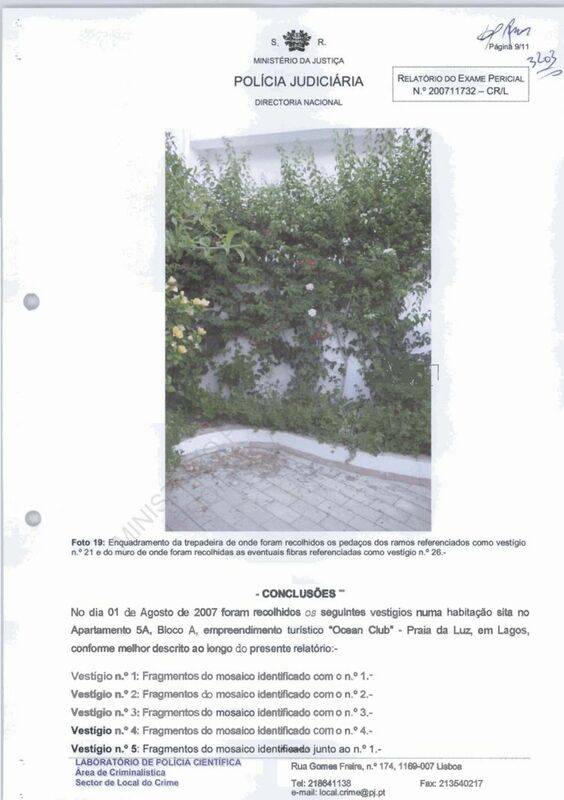 After the above there proceeded the collection of several branches of the climbing plant in the garden they having been encased in a paper package referenced as trace evidence number 21 and of possible fibres on a wall of the apartment garden, next to the climbing plant, using six Crystal-Tabs appropriate for this they having been referenced as trace evidence number 26. 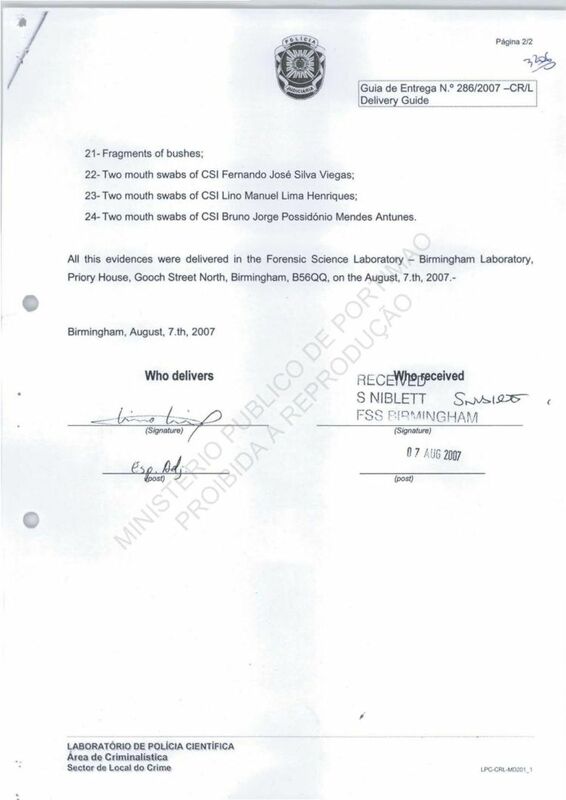 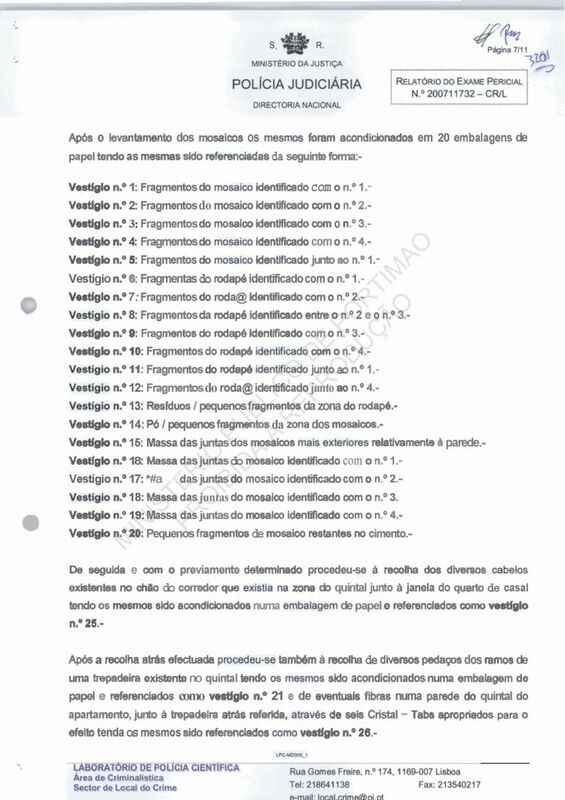 Further, oral swabs of the undersigned and Specialist Bruno A. were collected and referenced as trace evidence 22, 23 and 24.